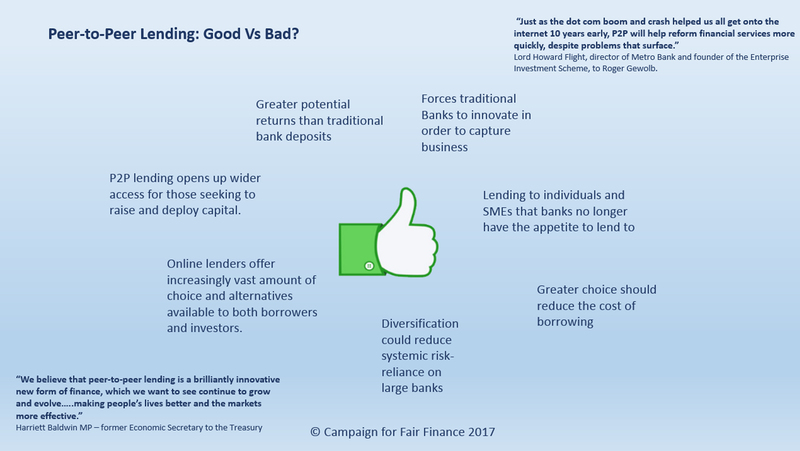 FairMoney.com is a standalone commercial project created by the Campaign for Fair Finance based on our “All Lenders Compare” project. 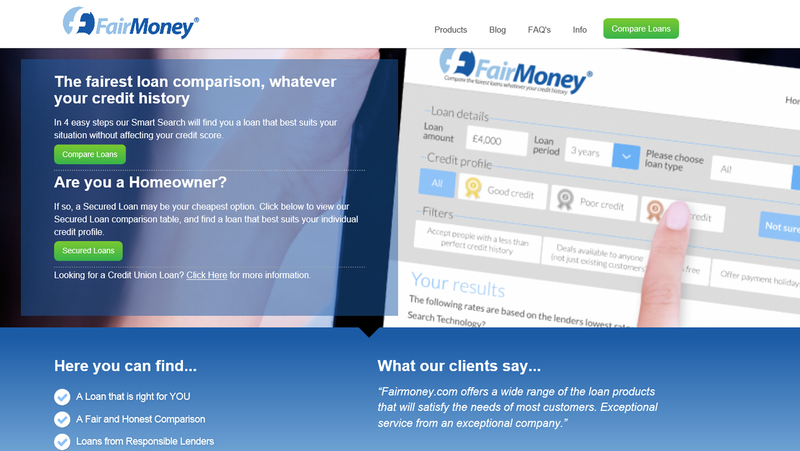 The Campaign for Fair Finance has handed the responsibility for the “All Lenders Compare” project to FairMoney, our market led solution to making loan product comparison available to all. At the Campaign for Fair Finance™ we believe that consumers need choice and in order to get that choice all forms of industry needs competition. This is of utmost importance within the consumer finance industry, more so than any other, whereby shopping around to find the best possible price and product is key. As consumers we all have our favourite shop/retailer; particularly when it comes to buys gifts and the latest tech. Whether it be on the high street or online we all have a favourite whether it be because (a) we have always shopped there, (b) they were recommended to us by a friend or even (c) we were attracted to them by their all singing all dancing advertising campaign. Chances are if we got it wrong and a cheaper alternative could have been found elsewhere the potential loss is likely to only have lost a few pounds. In the world of consumer finance however the potential loss could be far greater. With a credit card, loan or mortgage choosing the wrong retailer or provider can possibly end up costing you thousands upon thousands of pounds, and can even end up costing you your health and your home. That is why at the Campaign for Fair Finance we are pushing for all finance companies and firms to appear on a Price Comparison Website, and this is why we have created our “All Lenders Compare” Campaign and launched our own Fair Loans Price Comparison Website FairMoney.com. Through fairmoney™ we make available products designed for both Good and Bad Credit, whilst placing the emphasis on Fairness, bringing credit to the large section of the population who are cash poor, and at risk of taking out high cost loans in times of stress. Fairmoney™ enables us to engage with the likes of the payday industry (and others), with a joint cause of providing credit to the subprime sector but at fairest possible rates. At the same time our leadership threatens to expose unfair practice and profiteering simply by comparison. Therefore the subprime market will be better served, bringing liquidity into the lives of the people at the bottom of the economic pyramid in society. In addition, we’re putting our value led business together with disruptive technology. We anticipate the ongoing development of Price Comparison Website technology will continue to bring clarity to the real choices facing the borrower, and undercut the value of big firms marketing – therefore the best deals for the consumer will become more salient. Fairmoney™ offers the fairest possible rates regardless of credit profile. Fairmoney™ will make the finance industry plus all others that we deal with, focus on fairness not profit – at the same time continually improve itself, as we move forward together. At fairmoney™ we also believe that all lenders should make their products as accessible to as many customers as possible, to help increase consumer awareness into the wide range of products that are available. It is imperative that consumers know what products are available to them, while at the same time they also need to know that different lenders offer different rates. Another innovation of fairmoney™, and in line with our “All Lenders Compare” Campaign, is the introductions of the fairmoney™ approved lender programme. Through the programme, like minded lenders can display the approved lender logo on their own sites, which has a direct link to fairmoney™. Customers can then easily explore fairmoney™ for competitive rates as well as alternative products. At the same time the fairmoney™ approved lender logo will allow customers (both existing and new) to easily identify those lenders which act in a fair and responsible way. Both the campaign and fairmoney™ are actively pushing for change. The campaign for fair finance is the industry, commentator, regulatory facing parent organisation and fairmoney.com is the consumer facing business. Both share the same values, but they express them in different ways to maximise results and to extend fairness to as wide an audience as possible. Together the Campaign for Fair Finance and Fairmoney™ are selling fairness as a brand virtue…..
……and therefore we expect that this is a quality that can be applied to all financial service areas……. Where self regulation through the application of core company principles, can bring benefits to the consumer, and help rebuild once again the compact between business and society. In short – The innovation of running our state of the art disruptive technology together with the ethos of fairness – means that any change brought about by Fairmoney™ will have fairness throughout. We recognise that for anyone to become responsible and contributing members of society they need guidance on many issues, we believe that financial awareness is a fundamental factor to their health and well-being. In the United Kingdom the level of debt and subsequently those in debt-crisis is at an all-time high. Community Programme of Financial Enlightenment™: UK Consumers need to be better educated so that they understand how to manage their money and how to avoid unscrupulous or inappropriate lending. We are looking to develop and run a programme throughout the UK. Think through the financial dimensions of their next step in training, employment and further education. Fairness is a simple principle, and one that most people will sign up to. However, turning a general agreement into action is what we have to make happen. Blockchains stand to greatly improve fairness in finance. They can increase security and transparency and reduce risk and obfuscation, drastically minimising the scope for theft and fraud. The technology is still in relatively early stages of development but it is already beginning to change both the practical use of currency, securities, and contracts, and the way in which they are conceptualised. Cryptocurrencies, smart contracts, and Initial Coin Offerings (ICOs) are just some of a new wave of applications finding use in everything from remittances to land registry to shipping to capital raising. Knowledge and understanding.Blockchain technology is still developing. The ecosystem of this whole area of industry, the companies, people, and other participants, is also still developing.At its current stages participants need a certain level of knowledge and understanding to use, for example, cryptocurrencies more securely.It’s also too early for participants to be able to consider brand recognition, track records, or recommendations to help them make decisions on which services to use or on which companies are reliable.This presents some obvious risks to ensuring fair finance. Industry standards.This point follows from the above.In return for all of the benefits of blockchains they also create a large amount of self-responsibility. This is by design. All the elements of blockchains which make them a technological improvement are also inseparable from the features which give it immunity from third party interference. Blockchain technology is like the printing press. It offers a lot of great benefits but also has a lot of inherent political implications. Also like the printing press, the technology is here to stay, regardless of political opinion. It’s a global predicament. Financial regulators everywhere are puzzling about how to address the challenges posed by blockchains. Some proposed solutions may be good but perhaps only time will tell as blockchains become more prevalent. 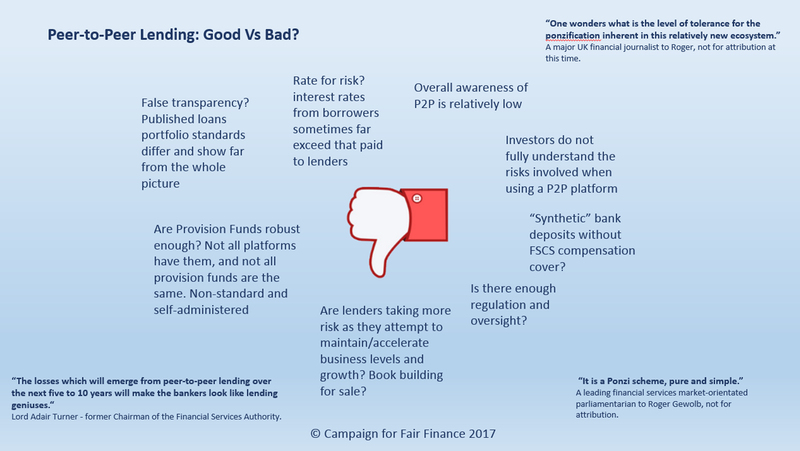 If for a range of reasons we cannot rely on traditional methods of regulation, this presents a risk to traditional methods of encouraging fair finance. Crime, misconduct, and incompetency.The overall state of the cryptocurrency and blockchain industry regarding crime, misconduct, and incompetency, has greatly improved since the infamous days of the Mt.Gox Bitcoin exchange collapse in 2013. Better scrutiny, security, disclosure, standards of practice, and accountability has raised the level of fairness for participants.However, there is still a great amount of scope for wrongdoing. The OneCoin Ponzi scheme, GemCoin, and the Ethereum DAO hack, Coin.mx, and the ASICBoost and Antbleed controversies are examples enough of how risky this industry still is. With all of that said, the Campaign for Fair Finance is optimistic. If technology will change the practical conduct of finance then we will campaign for new ways to encourage fairness. The Campaign for Fair Finance will advocate for a Code of Practice for cryptocurrencies and blockchain companies. The Campaign for Fair Finance™ review of the Crowdfunding and Peer-to-Peer industry. The developments in this area of the financial services industry are very empowering. Crowdfunding and P2P lending open up much broader access for those seeking to raise and deploy capital. Thanks to the internet and the greater access to information and communication we now enjoy, there are an increasingly vast amount of choices and alternatives available for businesses and investors. 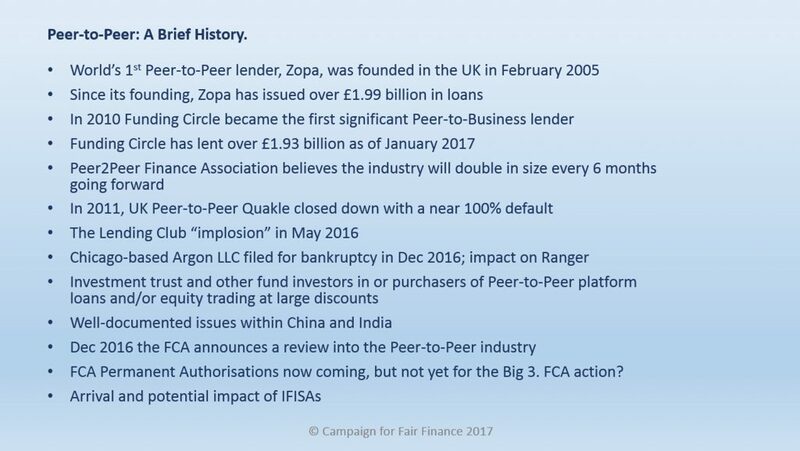 Crowdfunding and P2P lending are themselves great innovations for fairness in finance. Many of the businesses which seek to raise capital through crowdfunding and P2P lending are small or micro businesses. Many of the investors and lenders are private individuals rather than large financial institutions. Crowdfunding and P2P lending increase opportunities for those who were otherwise shut out or reliant on established gatekeepers. Crowdfunding and P2P lending also have the potential to reduce risk in the whole financial system. Different sources and methods of capital raising, reducing reliance on large investment banks, may in time reduce the risks posed by bank collapse as seen in the 07/08 crisis. The Campaign for Fair Finance is very much in favour of the ability that crowdfunding and P2P lending have to improve fairness in finance. However, the Campaign for Fair Finance has also identified a number of concerning issues. In the early days, crowdfunding and P2P lending were used primarily for small, product-based projects. For example, paying £15 for your favourite artist to record a new album, or a special release of a new film. It was a way to test and identify niche, geographically spread demand. This is still true as crowdfunding and P2P lending expand into the equity and debt capital markets. However, while there is similar openness for investors, their relative wealth is often not greater, the investors are not more financially aware or sophisticated, but the capital sought and allocated is greater. This presents certain risks and regulatory questions – to avoid them, many crowdfunding and P2P lending services arrange for investment in “tokens” that represent equities or debt. This means that investors have very different rights compared to investors in actual equity or debt issued by the project which is raising capital. In the worst case scenarios, it can cost the token holders at the expense of actual equity and debt holders if the project collapses, and with no rights of criminal or civil redress. The Financial Conduct Authority, the UK financial services regulatory authority, is beginning to ask serious questions and make regulatory decisions about some crowdfunding and P2P lending services as they expand into the capital markets. One particular decision, which has implications for fairness, is that the activities of some crowdfunders and P2P lenders amount to regulated activities which require licensing. The FCA is beginning to recognise that, in practice, some the way some crowdfunders and P2P lenders operate amounts to the running of a marketplace such as a multilateral trading facility or regulated market. At the most basic regulatory level it is very difficult to disagree with this assessment. Under European financial services regulation, the bringing together of buyers and sellers, is the core of what it is to operate an MTF or regulated market. At the moment, many crowdfunders and P2P lenders which offer equity and debt capital raising services, do not operate under licence or meet the regulatory, reporting, and other market oversight obligations that are rightly expected of an MTF operator or regulated market. Crowdfunders and P2P lenders do not have the same kinds of obligations when it comes to insider dealing, market manipulation, misleading statements and impressions, or other forms of market abuse. Measures to mitigate these problems are good for both issuers and investors. Credit Unions: How we promote the use of Credit Unions as an alternative to High Cost Short Term Loans. As a result of well documented bad press surrounding Payday Loan high interest rates, as well as recent revelations of irresponsible lending and bad practices throughout the industry, the Government, Church and Press alike have long urged Consumers to avoid potential debt misery by considering their local Credit Union as a safer and cheaper way to borrow money. The majority of Consumers who use Payday Loans do so in order to solve immediate debt issues. With most the constant cycle of Credit Card bills falling through the letter box landing on top of regular monthly commitments, causes stress levels within the household to increase. Consumers thus reach out for that quick fix that will help everything go away (well at least until their next payday). As per the World Council of Credit Union statistics, there are 397 Credit Unions within the UK, with over 1 million members nationwide. So why do so many people use Payday Loans? The most basic reason is in every newspaper, television screen, commercial radio station and ever increasingly on your local high street. Advertising. Whoever shouts the loudest gets noticed. Additionally Customers approach Payday lenders for Three main reasons: (1) because they need access to cash quickly (2) because they know that Payday will cater for customers with a poor credit profile In addition Payday Customers on the whole are from are of low income, and more often than not have suffered some financial difficulties, and thus could be classified by banking organisations as Sub-Prime in one way or another (either historical or currently). (3) because they do not know of any alternatives. As with most of the projects undertaken by the Campaign for Fair Finance, consumer education is key. The Campaign for Fair Finance is therefore working with the Credit Union industry, Trade Bodies, as well as His Grace the Archbishop of Canterbury and his Church Credit Champion Network to (1) Highlight exactly what Credit Unions can offer and (2) Promote the use of Credit Unions within communities. Who are the Law Commission? The Law Commission is the statutory independent body created by the Law Commissions Act 1965 to keep the law under review and to recommend reform where it is needed. The aim of the Commission is to ensure that the law is Fair, Modern, Simple and Effective. The Campaign for Fair Finance has been invited by the Law Commission to assist them examine the Bills of Sale Act 1878 to 1891 in order to make recommendations for reform, to ensure that the law in this area is up-to-date, fair, effective and ultimately fairer for the consumer. Bills of Sale have been in use since Victorian times. Towards the end of the 19th Century concerns were raised that moneylenders could use bills of sale to lead “thousands of honest and respectable people to their ruin”. It was widely thought that borrowers at the time did not understand the effect of what they were signing. They did not understand that they were transferring ownership of their goods to a lender, who in the event of default could then legally seize their goods. Equally if the customer had sold the these goods the lender could also seize the goods from a new purchaser, regardless as to whether they had bought the items in good faith, and were not aware of the lender’s interest. As a result of this confusion Parliament passed the Bills of Sale Act 1878 and the Bills of Sale Amendment Act 1882.5 , with both being referred to as the Bills of Sale Acts. How are Bills of Sale used today? In today’s world, bills of sale are used mainly in the form of “logbook loans”, whereby the amount borrowed by the customer is then secured against the borrower’s motor vehicle. Ownership of the vehicle is then transferred to the lender, while the customer continues to keep and use the vehicle. As like in Victorian times in the event of default or re-sale the lender can then legally repossess the vehicle from the customer and/or the innocent third-party purchaser. In September 2014, the Treasury asked the Law Commission to look at the legislation regulating logbook loans and consider how it can be reformed. The Law Commission published its provisional proposals in September 2015 and at the same time invited the Campaign for Fair Finance to help with their ongoing discussions on how best to reform the act. In June 2013 the then Office of Fair Trading (OFT) announce its decision to refer the market for Payday Lending to the Competition Commission (CC) for a market investigation. The OFT considered responses to their previous consultation, and were of the view that there were reasonable grounds for suspecting that the features of the payday lending market were preventing, restricting or distorting competition. On the 1st April 2014 The Competition Commission closed with all Its then functions (including the investigation into the Payday industry) being transferred to the Competition and Markets Authority (CMA). The CMA’s aim is to promote competition for the benefit of consumers, both within and outside the UK. Equally their aim is to make markets work well for consumers, businesses and the economy. 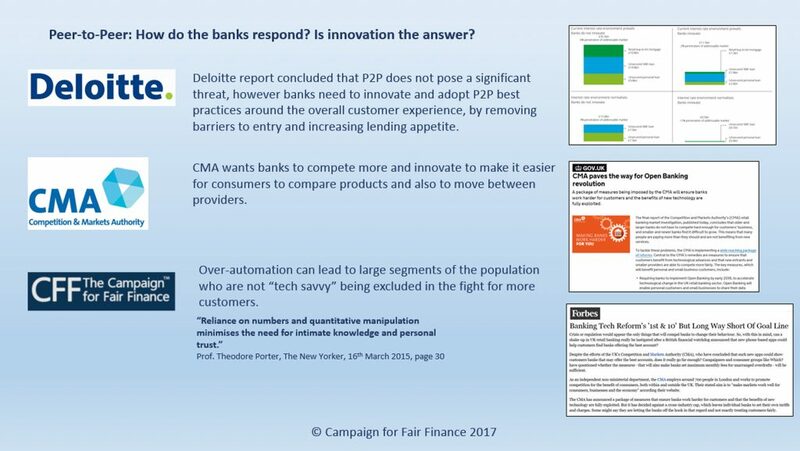 In July 2014, and as part of their continued investigation into the Payday Market, the CMA invited the Campaign to their London Office so the Campaign could voice its own opinion on how best to regulate loans in a Payday environment. For too long the Campaign felt strongly that consumer’s lending decisions were being led by large advertising campaigns rather than through the ability to find the cheapest loan option. Comparison was therefore key for consumers. Therefore, in order to best promote competition within the Payday Industry the Campaign recommended to the CMA that all Payday Lenders should appear on one or more Price Comparison Websites. As part of their final report, published in February 2015, the CMA accepted that all Payday Lenders should appear on at least one Finance Conduct Authority (FCA) Authorised Price Comparison Website (PCW). Equally and in line with FairMoney’s own Approved Lender Programme, the CMA recommended that Payday Lenders should be required to display prominently on their website a hyperlink to at least one FCA-authorised payday PCW. In their February 2015 report the CMA proposed six remedies to improve competition in the payday lending market, following the introduction of a price cap for high-cost short-term credit (HCSTC) by the FCA in 2014. The CMA recommended that the FCA review its standards for price comparison websites (PCWs) which display payday loans, before a CMA order requiring all payday lenders to list their products on at least one PCW comes into effect. disclose on their website the extent of their market coverage by listing the number and names of the firms whose products they compare. Following receipt of the CMA’s recommendations the FCA then began a process of consulting with industry and consumer groups to seek their views on the proposed CMA standards. The consultation closed on 28 January 2016. The industry now awaits the FCA’s final instructions..